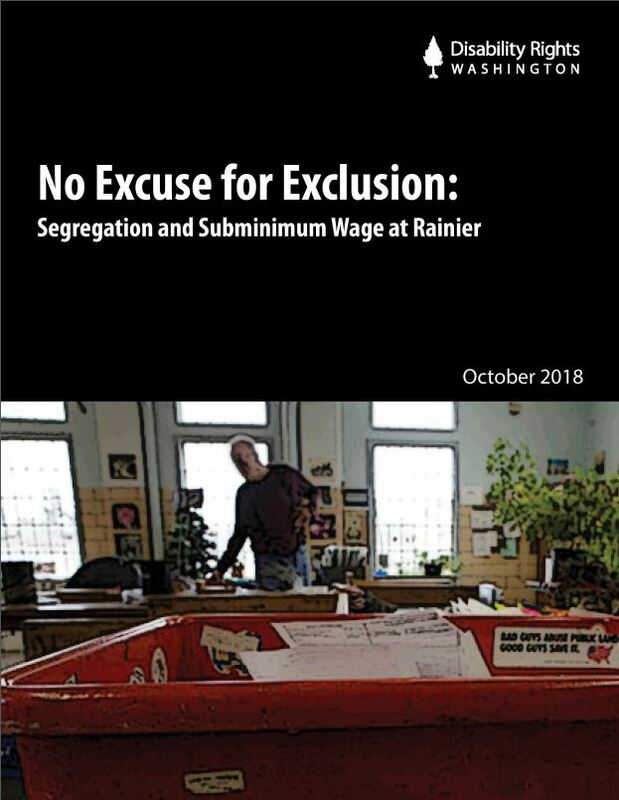 In No Excuse for Exclusion, Disability Rights Washington provides a look into employment at Rainier, one of Washington’s state-run institutions where people with developmental disabilities live. The report shows people are excluded from working jobs that are integrated in the community, are paid subminimum wage, and are assigned tasks in isolated locations that are not individualized to their abilities. Disability Rights Washington (DRW) has completed an investigation of Clarinda Academy, one of the many out-of-state institutions where Washington State has been sending foster youth with behavioral health needs. This investigation report discusses allegations by youth that they are subjected to verbal abuse and inappropriate/excessive physical restraints by staff. 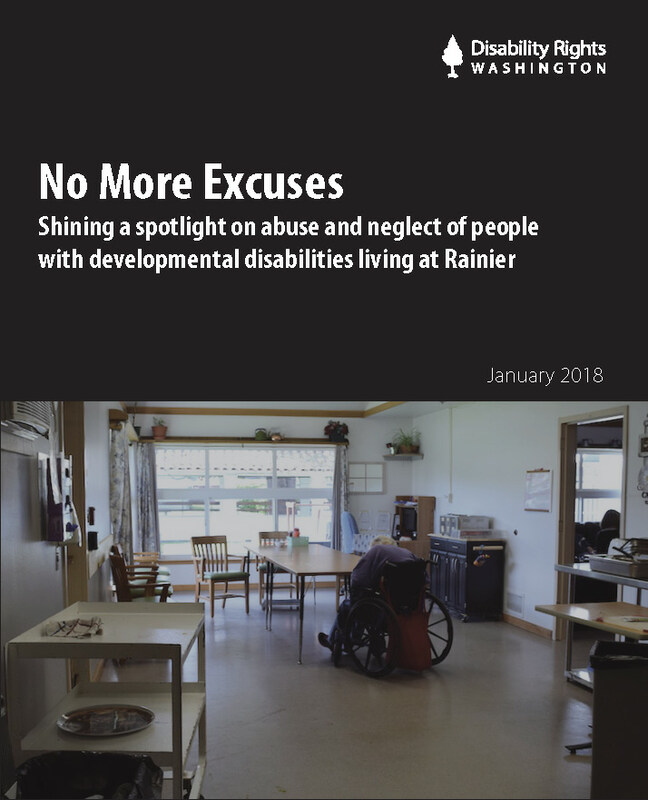 “No More Excuses: Shining a spotlight on abuse and neglect of people with developmental disabilities living at Rainier” sheds light on the pattern of unsafe conditions and lack of treatment occurring at Rainier, as identified in the state’s own surveys. While most of this information is publically available, it is apparent that the problems continue and meaningful change is needed. This report synthesizes a single year’s worth of information to call attention to the serious harm that continues to occur. 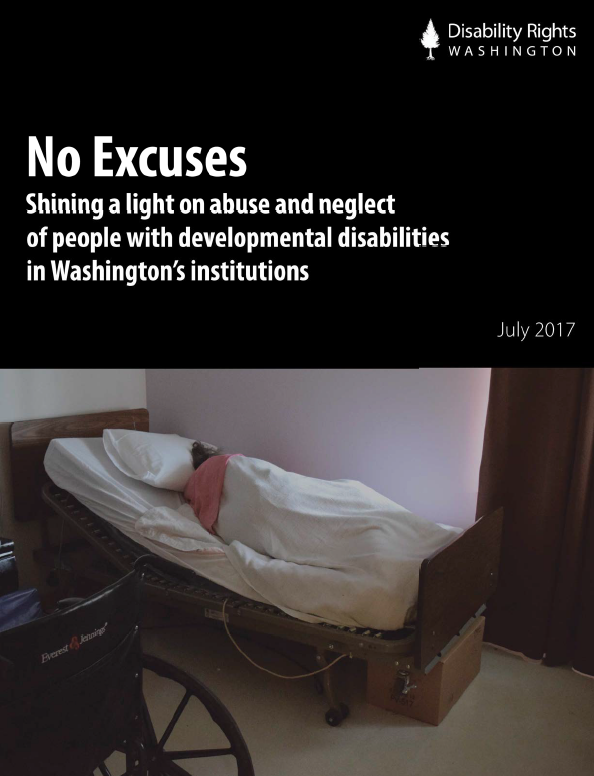 “No Excuses: Shining a light on abuse and neglect of people with developmental disabilities in Washington’s institutions” sheds light on the pattern of unsafe conditions and lack of treatment in Washington’s Residential Habilitation Centers (RHCs), as identified in the State’s own surveys. This report synthesizes a single year’s worth of information to call attention to the serious harm that continues to occur. These systemic failures endanger people with developmental disabilities in all of the RHCs and cannot continue, as there are no excuses for these failures. 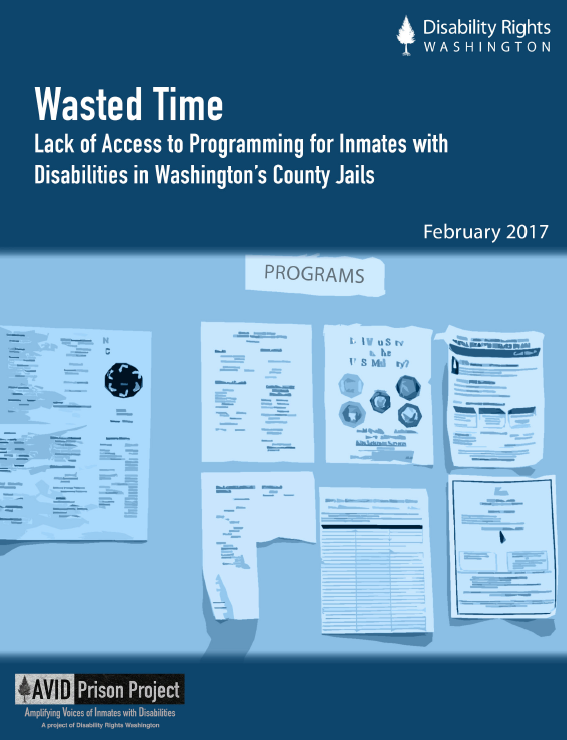 “Wasted Time: Lack of Access to Programming for Inmates with Disabilities in Washington’s County Jails” reports on the AVID Jail Project’s findings of very little programming or services for inmates. Although we incarcerate people with disabilities at disproportionately high rates, the vast majority of our jails do not make existing programs and services accessible for people with disabilities, and do not offer any programs targeted to these inmates. This report has been updated and is current as of March 1, 2017. 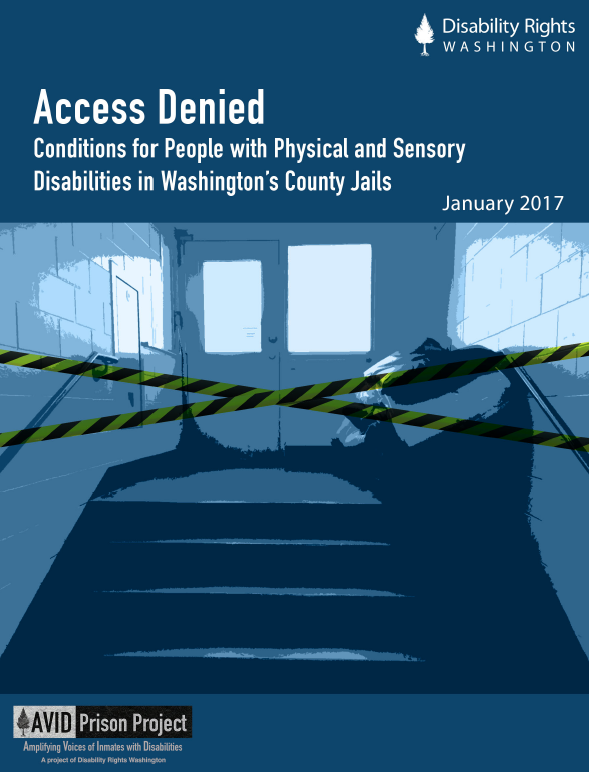 “Access Denied: Conditions for People with Physical and Sensory Disabilities in Washington’s County Jails” is one report in a series of reports intended to support an informed dialogue about how Washingtonians with disabilities are treated in county jails. This report explains the types of physical barriers and accessibility issues experience by inmates with disabilities in Washington’s county jails, and makes recommendations for change. It is produced by Disability Rights Washington’s AVID Jail Project. 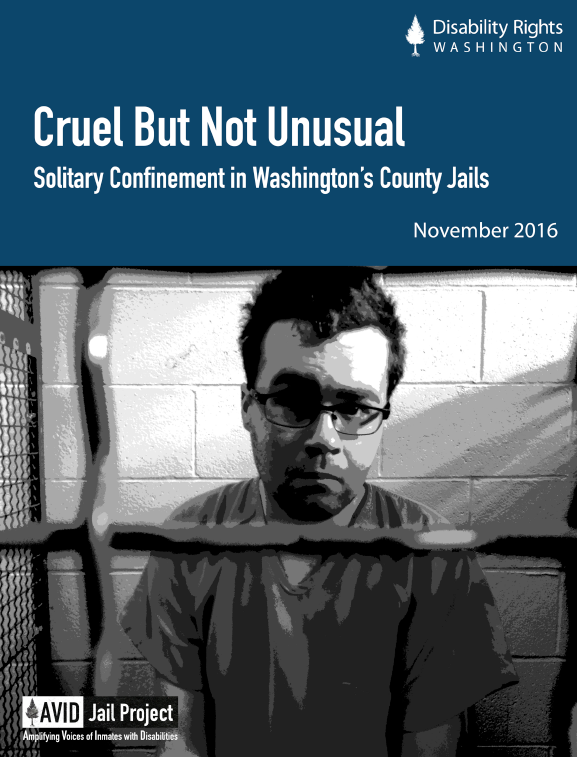 Solitary confinement in Washington’s county jails disproportionately affects people with disabilities. Many jails go so far as to place inmates with disabilities in solitary confinement because of their disability. 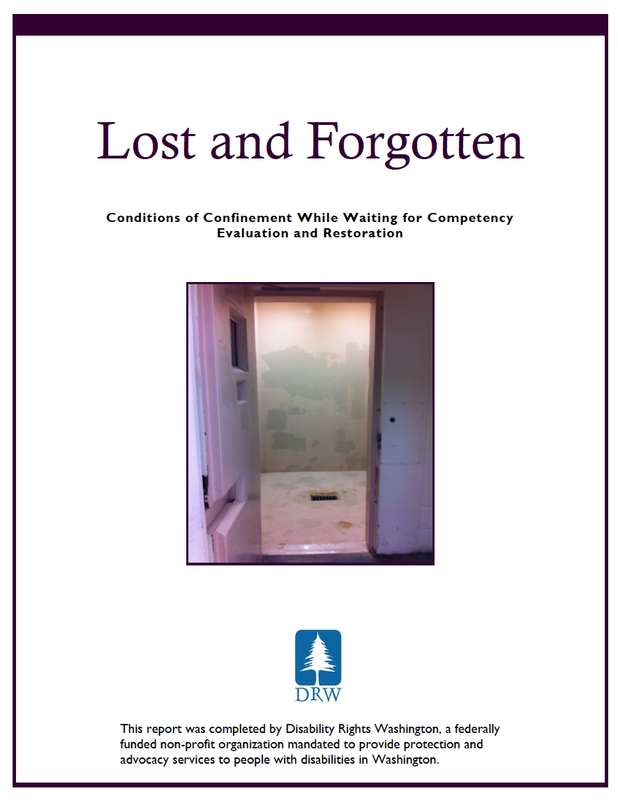 “Cruel but Not Unusual: Solitary Confinement in Washington’s County Jails” describes the harmful effects of solitary confinement on people with disabilities, provides overview of the disproportionate and discriminatory placement of people with disabilities in solitary confinement in Washington’s county jails, and identifies best practices and recommendations for reform. 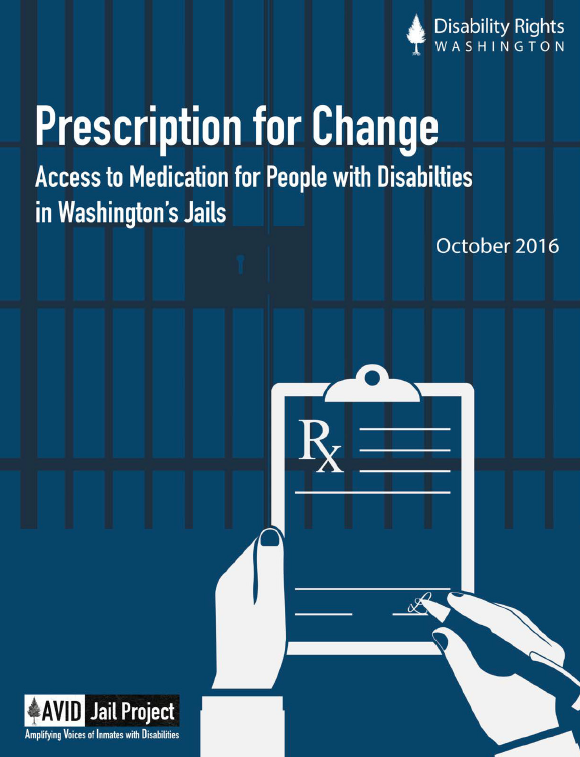 “Prescription for Change: Access to Medication for People with Disabilities in Jail” finds that our county jails often delay, disrupt or deny necessary prescription medication to people in their care. Prescription medication is a common and vital part of medical and mental health care for many people, including people with disabilities. By continuing to make it difficult or impossible for people to access necessary medication, Washington State’s jails risk violating the law and, more importantly, causing serious harm and even death. 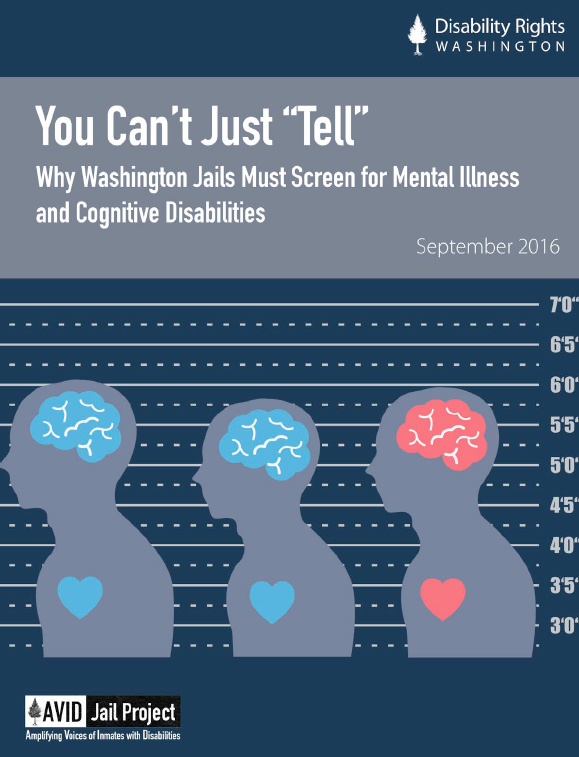 “You Can’t Just “Tell”: Why Washington Jails Must Screen for Mental Illness and Cognitive Disabilities” pinpoints the need for screening and early identification of inmates with disabilities to allow jails to provide legally-required services and reasonable accommodations and to maintain safety for all inmates and jail staff. 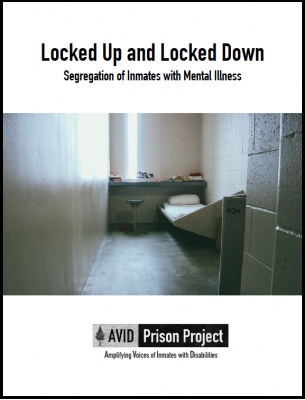 “Locked Up and Locked Down: Segregation of Inmates with Mental Illness” describes how between 80,000 and 100,000 inmates are currently segregated in prison cells nationwide for 22-24 hours per day, for days, months, years, and in some cases decades at a time. Segregation disproportionately affects inmates with mental illness and research shows that individuals may acquire symptoms of mental illness, or experience exacerbated symptoms of mental illness, as a result of the conditions in segregation. 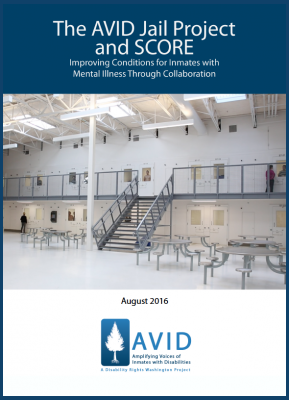 “The AVID Jail Project and SCORE: Improving Conditions for Inmates with Mental Illness Through Collaboration” explains the ongoing successful collaboration between Disability Rights Washington’s AVID Jail Project and South Correctional Entity (SCORE), a jail in South King County, Washington. The cooperative relationship between Disability Rights Washington and SCORE has produced significant positive changes for inmates with disabilities and demonstrates a path forward for all of Washington’s jails. “The Need for Accessible Voting in Jail” report calls on county jails and election offices to help jail inmates participate in the upcoming election. 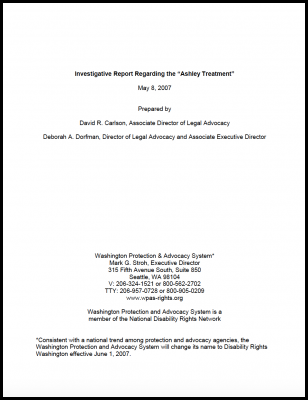 The report follows an investigation Disability Rights Washington’s AVID Jail Project conducted into the policies and conditions in every county jail across the state that found the vast majority of jails do nothing to support inmate voting. 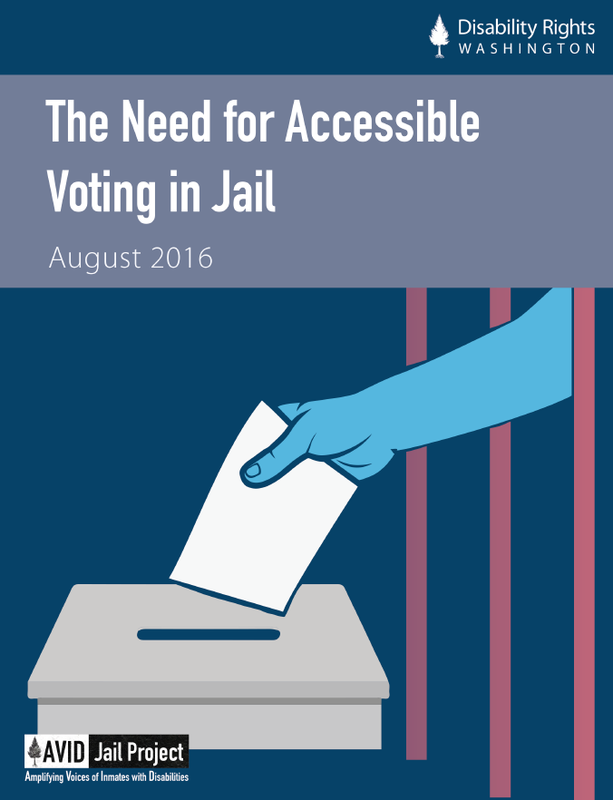 Read more about accessible voting in Washington’s jails. Many people with disabilities face barriers to voting. As a result, there is a disproportionately low turnout of Americans with disabilities in elections. Between May and July of 2016, Disability Rights Washington surveyed the elections websites of all 39 counties in Washington to screen basic accessibility of online voter information across the state. 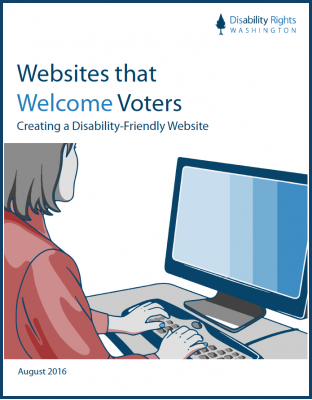 “Websites that Welcome Voters: Creating a Disability Friendly Website” is a summary of what we found, and our recommendations for improvements. As many as 31 percent of U.S. inmates in state prisons report having at least one disability. 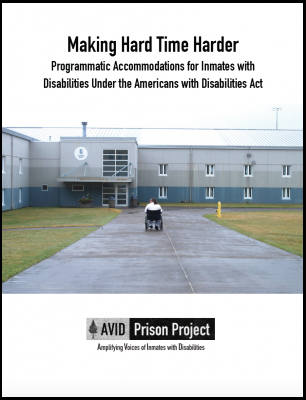 “Making Hard Time Harder: Programmatic Accommodations for Inmates with Disabilities Under the Americans with Disabilities Act” describes how inmates with disabilities often spend more time in prison, under harsher conditions, than inmates without disabilities. The high prevalence of disability in jail generates a requirement to meet the needs of numerous people with varying disabilities and medical conditions. Disability Rights Washington set out to investigate how well jails were doing in meeting the needs of people with disabilities. 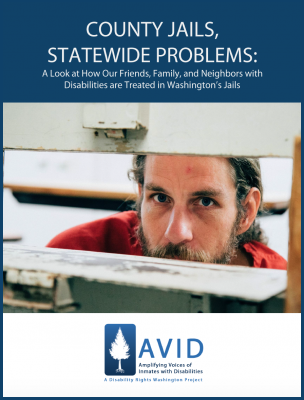 This report, “County jails, statewide problems: A look at how our friends, family and neighbors with disabilities are treated in Washington’s jails,” examines how friends, family, and neighbors with disabilities are treated in Washington’s jails. 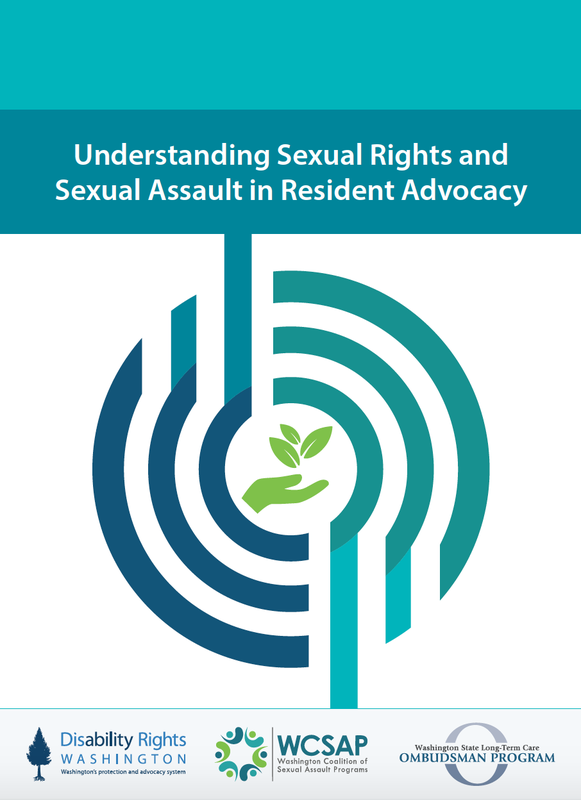 When long-term care residents experience sexual violence, they need access to effective advocacy. This resource booklet provides information for advocates who work in disability, long-term care, or with survivors of sexual assault. Disability Rights Washington monitored 14 employment vendors and met with multiple individuals who receive supported employment during summer 2014. Findings from this revealed many participants of Washington’s employment programs for people with developmental and intellectual disabilities still live largely isolated lives, work in segregated environments and receive little assistance to advance to integrated or viable employment. 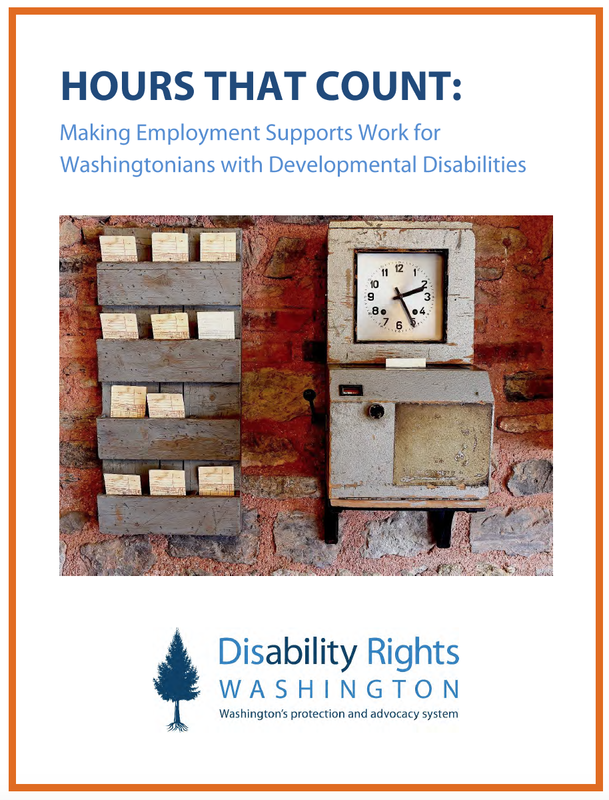 This is compiled in the report “Hours that Count: Making Employment Supports Work for Washingtonians with Developmental Disabilities”. 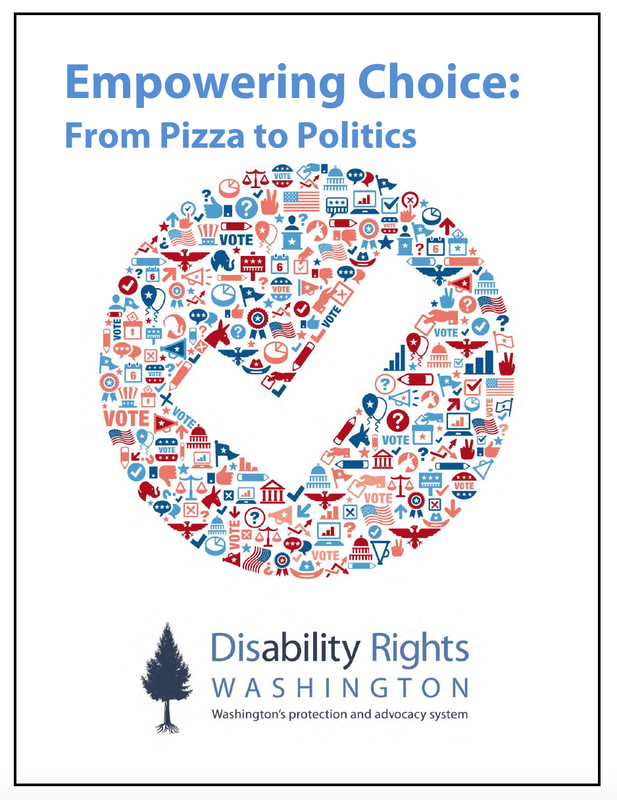 “Empowering Choice: from Pizza to Politics” report discusses Disability Rights Washington’s observations of everyday ways in which Supported Living providers can either facilitate or hamper people’s abilities to wholly engage in community life as equal society members, as articulated in the Residential Guidelines. Disability Rights Washington identified examples in three areas of decision-making and community engagement where people with disabilities participating in Supported Living programs can be supported to increase their political enfranchisement. People with mental illness, developmental disabilities, and traumatic brain injuries are being held in county jails from several weeks to months awaiting evaluation or restoration of their competency to stand trial. 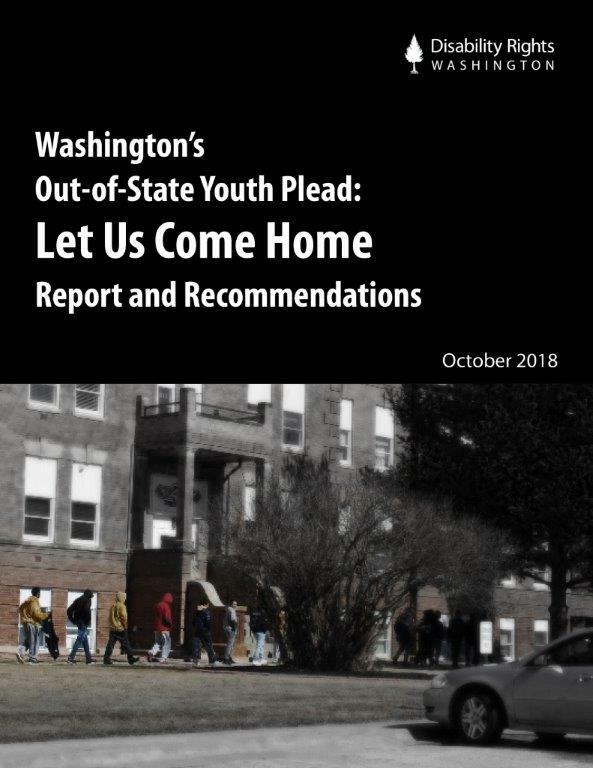 In this report, Disability Rights Washington documents the human cost of the time these individuals spend in jail, with inadequate or no mental health treatment, usually in isolation. 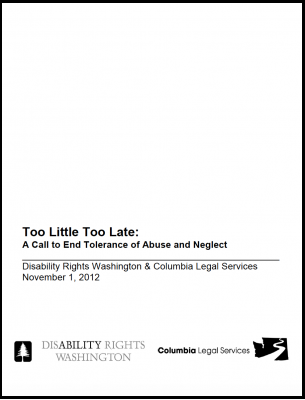 “Too Little Too Late: A call to end tolerance of abuse and neglect” documents the observations of Disability Rights Washington, Columbia Legal Services, and two nationally-recognized abuse and neglect response experts. Washington must stop ignoring the safety of the vulnerable citizens participating in the state’s Supporting Living program. The thought of doctors and parents, together, deciding to remove the body parts and stunt the growth of a child based on assumptions about their awareness and quality of life is shocking and disgusting. That it is happening to those unable to use their own voice is even worse. 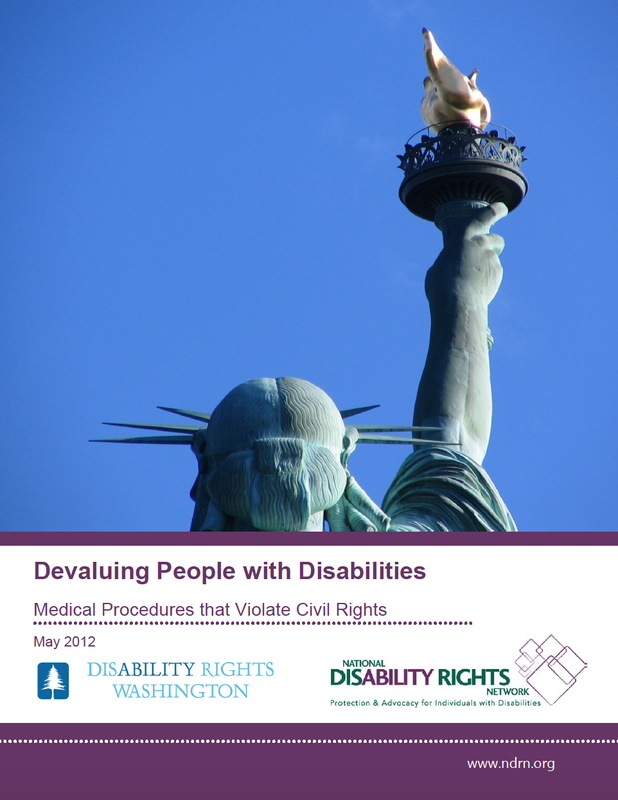 The National Disability Rights Network—in an effort to shed some light on this barbaric practice and thrust the medical community that supports it into the 21st century—has released this report called Devaluing People with Disabilities: Medical Procedures that Violate Civil Rights. 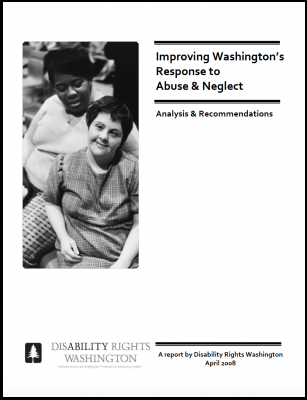 Washington’s system for responding to abuse and neglect of adults is currently failing to provide the protection that adults with disabilities need in order to live safely and with dignity. This report describes how the effectiveness of investigations is compromised by poorly conducted investigations, low substantiation rates, and lack of adequate policies and resources. This report also discusses other related issues including assessment of allegations, enforcement of mandatory reporting statutes, and the protection of alleged victims of abuse during ongoing investigations.